The military, for example, has been investing in the future of flexible electronics for several years now. In 2015, Defense Secretary Ash Carter launched a five-year campaign to create a next-gen military with the goal of improving U.S. manufacturing, particularly with regard to flexible electronics. As foldable and bendable displays appear in more commercial applications, it’s likely these devices will have a major impact on various market segments. Below, we identify what those markets are, and the corresponding applications of each. X-ray detectors, for example, are no exception. By replacing glass substrates with organic thin-film transistors, manufacturers are able to design X-ray detectors that are much lighter. Weight aside, plastic-based X-ray detectors can also be made much cheaper, considering there’s less material needed to house the glass in place. 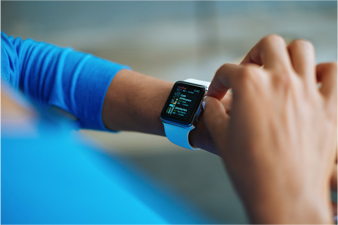 Flexible technologies have also made a splash in a number of health monitoring devices, such as the Apple Watch. With wearables, consumers are able to take a more proactive approach to their health by monitoring exercise levels and sleep schedules. The automotive industry is no stranger to flexible electronics. In fact, IHS Markit forecasts automotive display systems to grow more than 11 percent to $18.6 billion by the end of 2021. As cars become fully autonomous, the driving experience will change drastically. These applications have the power to completely revolutionize the aesthetics of a car, making it more functional than ever. The Centre for Process Innovation (CPI) is currently developing flexible OLED technologies to make windowless fuselage a reality. This includes embedding display screens into the lining panels of a plane to offer passengers a 365-degree panoramic view of the world around them. Thanks to live footage from external cameras, passengers would be able to select views from any side of the aircraft—regardless of where they sat. Beyond transforming the travel experience, eliminating windows would also enhance the safety and strength of an aircraft. According to CPI, “Over 80% of the fully laden weight of a commercial airliner is the aircraft itself and its fuel.” This reduction in weight translates to fuel savings—among other benefits. With less fuel onboard, these planes emit less carbon dioxide into the atmosphere, promoting environmentally friendly travel. Looking into the future, the flexible display market is set to disrupt several industries. Stay tuned for more information regarding flexible display applications. Promerus develops a variety of electronic materials for the next generation of applications in markets such as semiconductor, optoelectronic and electronic packaging. For more information, take a look at our materials and applications to see what Promerus can do for you.